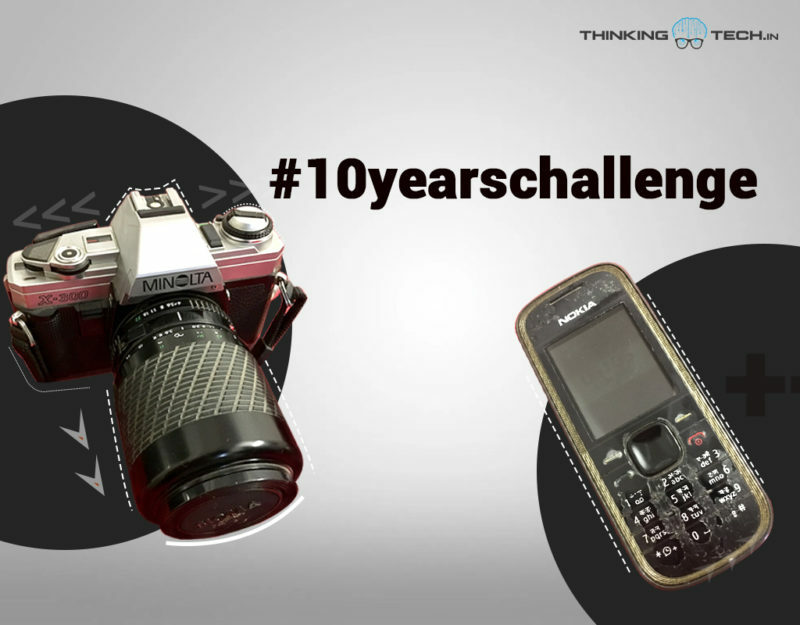 #10yearschallenge is the latest trending hashtag on Facebook. I take this opportunity to pen down my #10yearschallenge, in the field of technology. Being a 90’s kid, I have seen globalization come and grow faster like nothing around me. If my childhood and teenage were about experiencing the impact of globalization, the last 10 years was like running on 5th gear and keeping pace with the rapid change, on the tech front. Yes, in the last 10 years, we have seen the introduction and rapid growth of smartphones. Not only that, there are plenty more. I have learnt what a tablet is. My tryst with 4G phones began leaving behind the once favourite greyscale phones with snake game. I left my old calculator watch to adopt a Casio chronograph watch, stopped visiting cyber cafes for gaming on super slow old PCs running a dial-up connection and moved to an i5 laptop. While, having chat with friends over cups of tea has lost its track, Facebook, Twitter and Instagram became three great friends. Being a Kolkatan, yellow taxis have been a part of my budding years. That place has been replaced by Uber and Ola named app-based cab hailing services. Without owning a car, I can drive one for long road trips, thanks to the app called Zoomcar. Visiting local fast food stalls on weekends was a regular affair. Now, I don’t go to food but food comes to me, thanks to Swiggy and Zomato. It’s just a fingertip away. So, there are a lot of tech changes I adapted to in the last 10 years. Clearly, these were my #10yearschallenge with technology. No wonder these 10 years my life has become much easier in terms of connectivity and convenience, thanks to modern technologies. Earlier, getting a taxi was a hassle. But now all I need to do is open the ride-hailing app and book a cab. Also, no fuss with the driver about the fare. Cooking was never actually my forte, no matter how much I experiment nowadays. It was a stressful battle of thoughts what I should cook after coming back from office in the evening. Then Swiggy and Zomato came to my rescue. Now, getting Biryani in the middle of the night is just a 5-minute affair and it only takes 20 minutes to gobble on the food. No matter how weak and annoying the so-called 4G connectivity is, it’s still way better than that pesky dial-up connection I had from the state-run telecom company. Also, I have been able to set up own WiFi at home. Whatsapp and Facebook video calling have made it smooth like butter for me to connect with my aunt in the USA than writing those airmails. That was another way of me overcoming #10yearschallenge of technology. I love photography and I had my first camera in 2003, a Vivitar T301. Also had a Minolta later. Those days, I had no option to check after the click and delete if needed. And boy, buying the 35mm reel and developing the photographs were a pricey affair for me in those days. Now, I have a Canon 5D and Sony Cybershot DSC-HX400V as well. No more worries about getting a bad shot and wasting the reel. Also, storage is no issue anymore. That was another challenge among my list of #10yearschallenge I overcame with time. So far, this was just my story how I tackled and overcame my #10yearschallenge. Well, this is not only my story but of countless more of my generation. Next articleIs Your Email Address And Password Compromised In Largest Data Breach Ever?